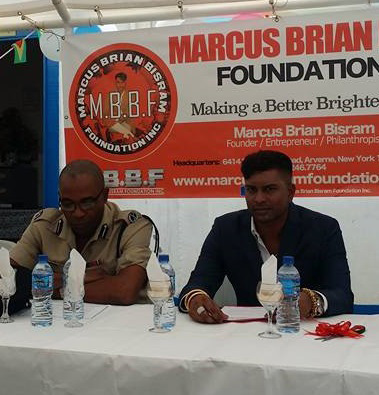 The Marcus Brian Bisram Foundation (MBBF) on Thursday held the re-opening ceremony for the newly remodelled traffic department at the Springlands Police Station. Earlier in the year, the Founder, Chief Executive Officer and President of MBBF, Marcus Brian Bisram pledged $200M per year to Guyana. Remodelling the traffic department was one of the first tasks completed. Bisram during his speech charged the traffic officers, who will be housed in the building, to take care of it. He said “I fervently hope that those that use this facility treat it with care to allow it to withstand generations to come”. The cost of the remodeling is estimated at approximately $2M. Bisram thanked the Commander of B Division, Ian Amsterdam, for his expediting of the process. Bisram pledged funding for two medical surgeries for persons in the Corentyne area. He told Stabroek News that although their office and board are based in the United States, he travels to Guyana monthly, to spearhead the different projects. He told the lawmen, regional officials and citizens gathered that this project was just the beginning of the pledge.